While the average UK shopper is part of 3 loyalty programmes, a third don’t believe they get sufficiently targeted offers in the physical store environment, compared to the customised offers they receive online. 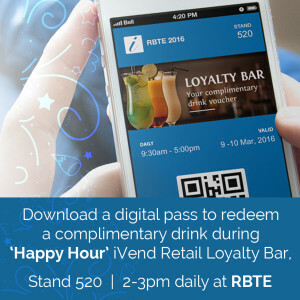 With over half (51%) of UK shoppers saying they would like personalised offers sent regularly to their mobile phone or via a mobile app as they enter the store, allowing them to collect and redeem points both in-store and online, iVend Retail will be demonstrating the benefits of embracing a mobile-first loyalty scheme on its stand at RBTE 2016 (9th and 10th March, London Olympia). Located on stand 520, retail experts from iVend will be showcasing a range of omnichannel solutions as well as the latest in mobile loyalty – digital passes – at its exclusive Loyalty Bar, along with a whole range of omnichannel solutions from iVend and selected partners. As smartphones are increasingly becoming the consumer’s shop window, digital passes embed retailers and brands more deeply in the hearts of their customers and tap into the growing trend for mobile interactions. By geo-locating shoppers with personalised offers based on their location, iVend digital passes are stored on an iPhone or Android Device and send an automatic notification which can be viewed even on a ‘locked’ screen. What’s more, with selected partners on the iVend stand, including Dedagroup and its Stealth Fashion Ecosystem Digital HUB, Retail Store with RS Count, TRC who will be showcasing its Intelligent Fitting Room technology and Venistar with digital solutions for Omnichannel Distribution & Retail, Single Customer View and CX oriented Marketing Automation, RBTE, Europe’s biggest retail technology expo, is free to visit and is a must attend event for retail, hospitality, travel, entertainment and leisure operators and retailers who want to keep up to date with the latest solutions.